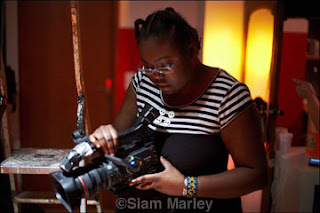 Interview with French-based Siam Marley from Cote d’Ivoire by Beti Ellerson. With candour she talks about her passion for cinema, her dreams, and her desire to remain true to herself in an environment that is not always receptive. Siam, tell us a little about yourself, from Ivory Coast to France, what were your experiences? Good evening everyone, my name is Siam Marley. Contrary to what my name may say, I am Ivorian, but I have lived in France for the last ten years. I followed an “academic” path at the film school EICAR, Ecole Internationale de Création Audiovisuelle et de Réalisation (International school for audiovisual creation and filmmaking). As "an apprentice" I made a few shorts, three if I'm not mistaken. I'm also "apprentice" director of photography, "apprentice" cameraperson, and "apprentice" scriptwriter! (Laughter) I have worked independently for some time, and I try to somehow make a little place for myself in this environment. Cinematographer, camera operator, director, screenwriter, you're pretty versatile. By necessity? Or is it in order to have the independence to express yourself as a filmmaker? You made La Rue (The Street), the rap-style short film essay on the 2007 events in the housing projects outside of Paris. What inspired you to make this film? Some thoughts on the choice of your subject and the approach you used? Honestly, La Rue is a clip I made for the rapper Dewawa, doing the camera and lighting myself. He was the one with the message. And it was his sound! (Laughter) I did it for the experience. And well, I liked the beat. But it's true that I'm a fan of rap...perhaps not as much as some of the people in my entourage, but I do like rap. You are associated with June Prods, what are its objectives? How was your first film production experience in Côte d’Ivoire? My film production experience in Côte d’Ivoire really started in October 2010 when I did my “first short Ivorian film", that is to say, with Ivorian actors and shot in Côte d’Ivoire and it was a great experience! Babi was a test film. I was in Abidjan to do a bit of an update on my life and look at my options after my studies in film school. And I made this film to test the waters. I wanted to attain the technical success that would assist me in attracting the interest of people or investors for future projects that I plan to do there. We shot the film in four days, I received a lot of support for this project: such as from Jeremy Strohm who generously worked with me on the film; Afrikareprezenta, which helped out with a few projectors, my older brother and his friend who lent me their apartments. I cannot mention everyone, but it was just great. This experience made me want to return there to make a film! I am planning to shoot the film called "Cinq boîtes de lait" (Five cartons of milk)! Ivorian cinema is trying to find its place. What contribution would you like to make? Cinema Ivorian has still a long way to go...I obviously want to become the first Ivorian female director to win an Oscar (Laughter)! Honestly though, I just want to have the same chance as a French or American director (to name only these few here). In general, Ivorians have stopped going to the movie theatre. So whenever there is an "Ivorian film" which is released in the "only" (if I'm not exaggerating) theatre in the city, those who attend are mainly young people and those from the upscale neighbourhoods. The cultural divide is a reflection of the social divide. As many like to say: "we cannot even manage to eat, so how can we go to the movies...” It's sad, but true, day-to-day existence has taken over the dream. But as far as I know in Côte d’Ivoire, there are more and more film shoots. Though unfortunately in my opinion, there are more film shoots for film clips rather than fiction films, but hopefully this will change soon! Moreover, there are not enough quality Ivorian films offered, nor movie theatres for the viewer to have the pleasure of watching films on the big screen. But I do note that there is a genuine desire to create quality film projects (enough of these sitcoms, which do not reflect Ivorian cinema) on the part of young Ivorians who realise that they too have a vision of the world and that they can share it with the planet. We just need someone who believes in us and supports us. I heard someone say that the future of cinema is in Africa and I genuinely believe it. We will use the technology created by the West to tell our stories! We have everything to gain. Then please, give us a chance. What are your experiences with the filmmakers and professionals in Côte d’Ivoire? I met the director Arantess Bonalii who has a real vision for Ivorian cinema, he is one of the pioneers there, he helped me a lot for this short, evening lending me his apartment, among other things, so I could shoot there. I cannot thank him enough! I also met a young director Armand Breh, a truly strong man, considering his journey. With virtually nothing, he directed his first short fiction film, A Moment of Silence (related to the war in Côte d’Ivoire in 2011). He initiated a campaign for funding on the Internet via Ulule, though no one has followed through on their promises, but he still made his film. If he had had the necessary resources, the film would have been different for sure, but the technical quality is definitely there, and I urge him to keep going. These people amaze me by their determination, they expect no help, continue to persevere, and rely only on God to lead them towards their dreams! I, who am so easily discouraged, have so much to learn from them. I also regret the fact that Ivorian directors, whether of feature films or series, do not rely on the most competent technicians of the same nationality, or Africans living in Europe. When I apply for a position, these directors appear reluctant, afraid of what it will cost them, that is to say, the plane ticket and fees! Then they freak out, and continue focusing on the local technicians who do not have enough technical or artistic training. Of course I understand why, though I am not happy about it. What are the differences between working in Côte d’Ivoire and in France? Each country faces different realities! I do not really know how people work in Côte d’Ivoire; I only made that one short film. But I noticed that there are not many skilled technicians, there is an effort to improve but there is still a ways to go! Most of the people in the field (especially technicians) never work for free; they really do not care about your project unless they can make money. They could care less about the hardships you encounter trying to do your film. There is no artistic interaction! Most people do not do make films by passion...but for the money! That said, there are those who do have a passion for it. There are no Ivorian actors, or else they do not live in Côte d’Ivoire. There, it is more theatrical...rather arduous and linear...even if they do it well. But I hope they continue! Life is tough there, so people do what they can. In France, for now, I'm in the shallows! (Laughter) Seriously, people here are willing to give you a hand when they believe in your project; you can make a short film without "paying" anyone. There is more creative freedom. There are talented technicians, actors who tear your guts out, and artistic ideas that can make one jealous. I feel privileged to work here, despite the difficulties. But despite the freedom I have working in France, I still prefer making films in Africa. That said, I do not put up barriers for myself. The films that I aspire to make will have no other label than that of my nationality! How is the film culture in which you work in France? Classic French, international, African, female, young, a mixture? I have been lucky since I became part of this culture, to have met people who encouraged me to persevere, to believe in my potential and especially in myself, such as my friends Maxwell Cadevall and Jeremy Strohm, among others. A young black woman as DP, there aren’t many, I'd like to meet other women like me in this position. I have also come across people filled with prejudices towards me, my skin colour, my weight, and just for the way that I am! These narrow-minded people who think that they are the centre of the universe or that they are such awesome directors and technicians, it’s sickening! I try to adjust these aspects as I try to fit in but it destabilises me quite a bit! I take less and less offence at these things, I remain faithful to my principles and myself. I am who I am. I admire all the talent around me, I compare myself to them, I listen and I learn from them. I hope to become a better person, a little more each day in their presence. I have a lot of projects. As indeed it should be! Parallel to my work as technician for the projects of others, I am preparing one of my next shorts "Cinq boîtes de lait" based on a novel of the same name by a talented friend and writer, Yehni Djidji. It is a story that takes place during the events that disfigured Côte d’Ivoire in early 2011! With her work I hope through this film to pay tribute to all the innocent victims of this stupid war between these selfish people who only think about themselves and not the people. This unfortunately, has been the history of Africa for far too long. This must stop, and I hope that this film will be seen in Africa and beyond, so that people realise what they really mean to these leaders. And they will finally say: Stop. We're fed up! Interview and translation from French by Beti Ellerson, March 2012.